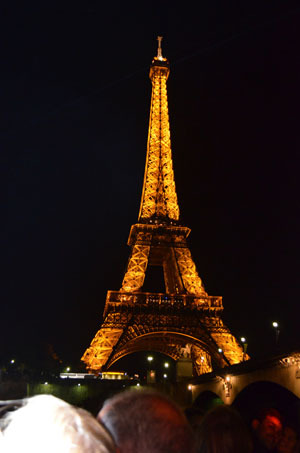 We’ve had many fantastic Paris France vacations. Our most recent visit was 3 days and came at the end of 2 weeks in France. I’ve split this article into 3 parts since we did so much. I have many tips to help your trip planning. From Bordeaux in southwest France we took the high speed TGV train to Paris. France train travel is very efficient and easier than driving into Paris. We arrived at Gare Montparnasse. Gare Montparnasse is the train station that serves Northwest France and the TGV trains to and from Southwest France. Took a taxi to the Latin quarter and our hotel. Taking a taxi is much easier after a long travel day rather then navigating the metro/bus system. We saved that for later. 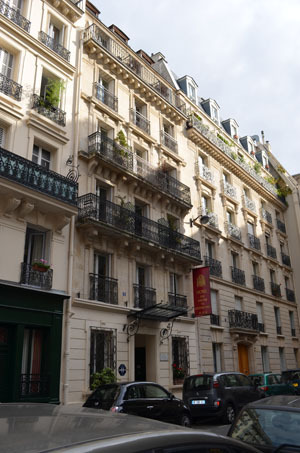 In planning the trip I did a lot of searching for places to stay in Paris (I will go into more detail in my next article) and found this very nice hotel, not expensive as nice hotels go. Quiet, clean and the bed very comfortable. And linens were especially luxurious. Tiny room, but hey this is Paris and rooms are small. 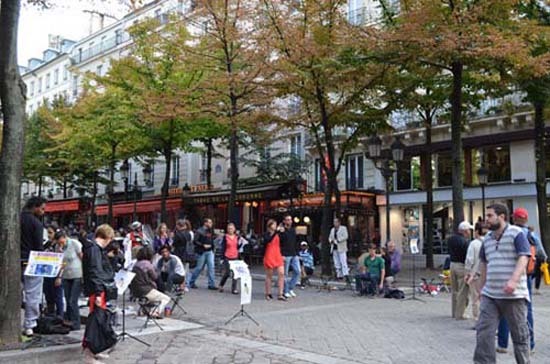 If you like the lively Latin quarter neighborhood this is a great choice for shopping in Paris and many cafes. Only negative is that it’s several blocks from the metro. 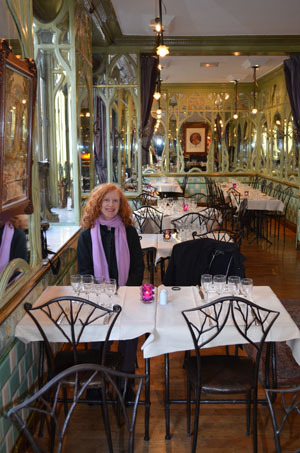 That evening we met Megan (she loved the gift) and her mom Claire for dinner at “Bouillon Racine”. 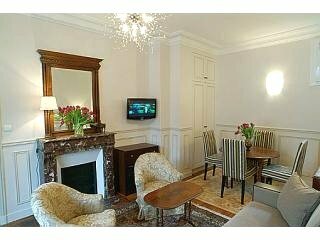 Beautifully renovated old bouillon house as you can see from the photo above. Highly recommended in guidebooks. Filled up with tourist groups as the evening went on. Mediocre food and pretentious, I would never eat there again. But it was pretty. 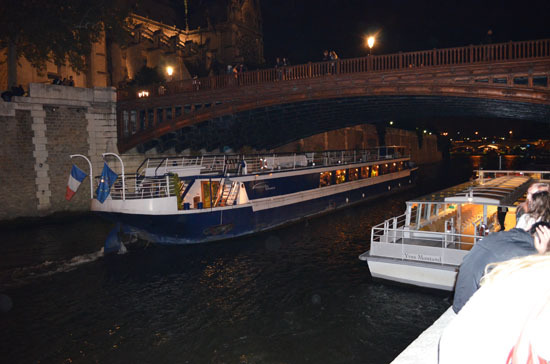 Claire so generously treated us all to a Bateau Mouches, “Paris by Night” Seine river cruise. She loves the river cruise at night and finds it a great way to relax after a long day of taking care of her younger children. I have to agree. So many beautiful sights all illuminated and beautiful. The wind whips through your hair and you feel the pulse of Paris. All the monuments of Paris were lit and I got great pictures.